It’s Pi(e) Day! I teamed up with 20 food bloggers to celebrate. 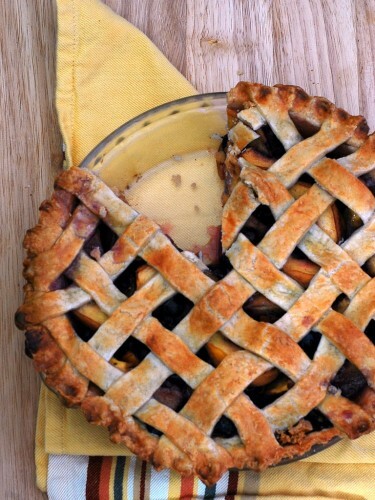 I made a delicious vanilla-scented peach-blueberry pie in a sweet pie crust. Welcome to Pi(e) Day hosted by Terri from Love and Confections! Pi Day is celebrated every March 14 by math fans around the world – and also bakers and pastry chefs. Pi is an non-repeating, infinite number represented by the Greek letter π, and used to represent the ratio of the circumference of a circle to its diameter. Today, March 14, 2015, is an extra special Pi Day, because at 9:26:53 AM it creates the “Pi Moment of the Century”. The first ten digits of Pi are 3.141592653 (3/14/15, 9:26 AM and 53 seconds). This exact date and time happens once every hundred years – a once in a lifetime moment for most of us. How cool is that? Today, 20 Food Bloggers have gathered and want to celebrate the fun of Pi by creating their own sweet and savory pies to share with you. Hope you have a delicious day! I wanted to do a classic fruit pie. 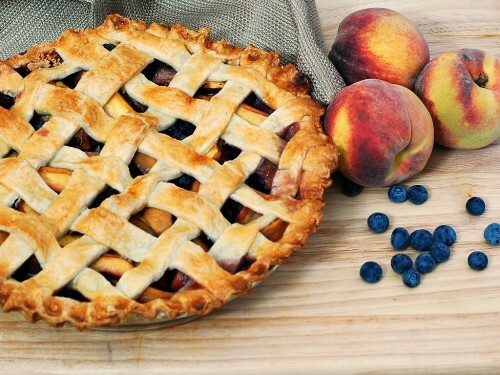 This pie is loaded with peaches and blueberries. 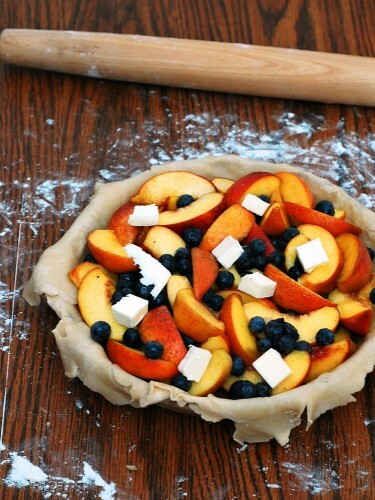 The best part about this pie is that the peaches don’t need to be peeled. Less prep work means less time until delicious pie is ready to eat! Tossing the peaches and blueberries in vanilla sugar concentrates the flavor of the fruit by extracting the juices, and adds a subtle vanilla flavor to the fruit. Vanilla sugar can be purchased, but it’s very easy to make at home. Place 1 cup of regular white sugar in an airtight container. Add half of a vanilla bean, whole or scraped. Bury the bean in the sugar. Let it sit for a week or two, shaking occasionally. Use it just like regular sugar. It’s awesome in coffee! If you don’t have vanilla sugar, and don’t want to wait 1 or 2 weeks for this pie (and I don’t blame you!) just use regular sugar. Make the pie dough: Place the flour, salt and sugar in the bowl of a food processor. Pulse a few times to mix. Add the butter cubes and shortening to the flour mixture, pulse 8 to 12 times, until the mixture resembles coarse crumbs. While pulsing the machine, slowly stream 6 tbsp of the ice water into the food processor, until dough starts to form large clumps. If it doesn't, add more ice water, a tablespoon at a time, until large clumps form. Scrape clumps onto a floured surface and form into a ball. Flatten into a disk, wrap in plastic wrap, and refrigerate for at least 30 minutes. While the pie dough is resting, slice each peach in half, then slice each half into 4 wedges. Place the peach wedges in a large mixing bowl. Add the blueberries, and the vanilla sugar. Toss to coat, set aside. Remove the pie dough from the refrigerator and unwrap. Divide the dough in half. Preheat the oven to 400 degrees. On a well-floured surface, roll one half of the dough into a circle about 12 inches in diameter. Gently fold in half and place in a 9-inch pie plate. Carefully unfold the pie dough and trim overhang to half an inch. Brush a thin layer of egg white over the bottom and sides of the pie crust. Set aside. Set a fine-mesh sieve over a measuring cup. Scrape the filling into the sieve. Reserve the juices in the measuring cup. Pour the fruit into the pie plate. Place the reserved juices in a small saucepan and set over medium heat. Bring to a boil and cook until reduced to a syrup. Pour over the fruit pie filling. Dot the filling with the butter cubes. Roll the second half of the pie dough into a 12-inch circle and place on top of the filling. Trim overhang to half an inch, and press edges together with the bottom crust. Pinch decoratively to seal. Cut vents in the top crust. Whisk together the egg yolk and the water, and brush onto the top crust. Place the pie plate on a baking sheet and place in the oven. Bake for 60 to 75 minutes, until the crust is golden brown and the filling is bubbly. Remove the baking sheet from the oven and place the pie plate on a wire rack to cool for at least two hours. Your pie looks wonderful and I am confounded because it sliced so cleanly and beautifully. I thought you must have had a thickening agent in the filling but don’t see one. My fruit pies flow all over the place… I would love if you would share your secret with me. Hi Wendy! I concentrate the juices by boiling them before even baking the pie. That being said — I chilled the pie in the refrigerator before slicing and photographing it! This pie looks gorgeous Coleen! 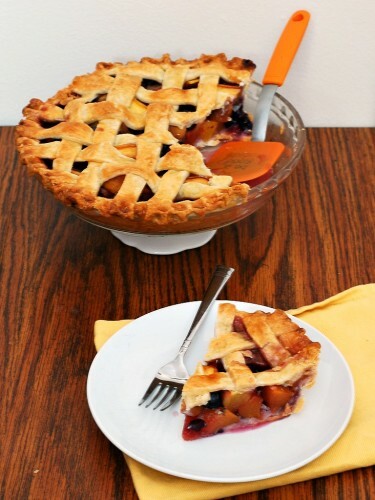 I always love a lattice top and you can’t go wrong with peach and blueberry. Thanks for joining in. Looks delicious, looking forward to baking soon! Happy Pi(e) Day! Blueberry and peach sounds like an awesome flavor combination! Looks great! That is one pretty pie! I have no idea how to make a crust like that! I’d like a slice, please! I read your response on how you got the perfect slice, love the tip to refrigerate before slicing. I never have enough patience. 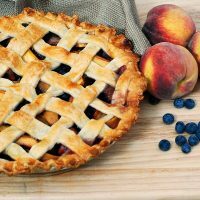 Your peach blueberry pie is just lovely for Pi(e) Day!! What an incredible pie for PiDay! Thanks for sharing at yumgoggle.com! Classic fruit pies are my favorite. I would love a fat slice of this…warm with a scoop of vanilla ice cream! Sp pretty! Love that perfect lattice! What a perfect lattice crust, Coleen! I aspire to make one as perfect and pretty someday! Thanks for the link to your tutorial in the comments. I’ll be pinning that as well! Mmm such a great flavor combination. Makes me ready for summer fruit picking! What a great flavor combination – my husband would go crazy for this pie.